Jeff has been practicing physiotherapy for many years, having broad experience in both the public and private sector. Originally from Melbourne, he has spent the last 25 years living and working in North East Victoria. Most of this time he has been working in private practice, where his interests are particularly in the management of neck and back issues, with strong emphasis on manual techniques. However, having worked for many years in smaller rural clinics, Jeff has broad experience in all aspects of musculoskeletal physiotherapy. 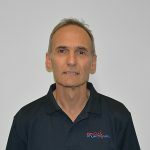 Over the years of practice, Jeff has also spent time working in the Workplace Rehabilitation field, as well as providing physiotherapy services within the Victorian prison system. Outside of work, Jeff spends much of his time trying to keep up with his three teenage sons (which he feels at times is becoming rather challenging). He also enjoys long distance cycling and when time permits, will occasionally dabble in amateur theatre.